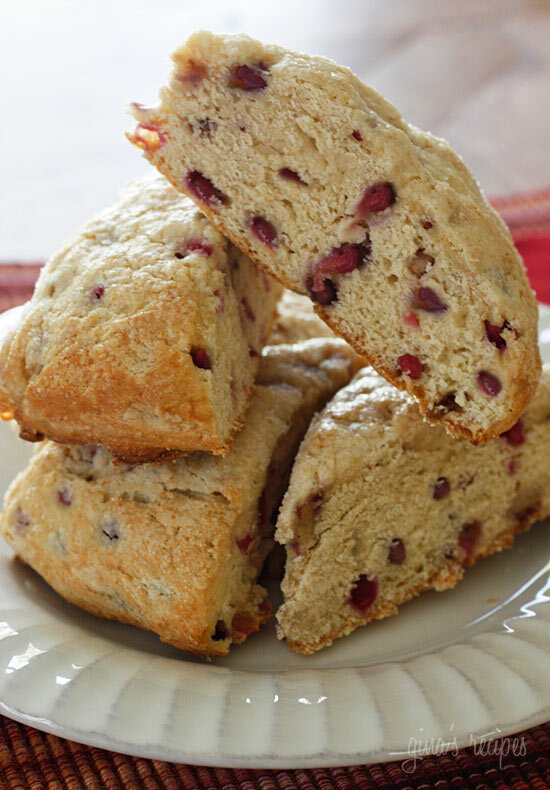 These fresh baked scones are low fat, and studded with ruby red pomegranate arils. The key to making perfect scones is to not over-knead the dough, and to make sure your butter is chilled. For those of you not familiar with scones, scones are lightly sweetened English biscuits served at tea time. I love serving them with light butter and honey, some people prefer jam (pomegranate jelly would be great!). Leftovers can be stored in air-tight containers for up to two days. Since returning from my trip to Fresno where I was invited to POM’s Harvest Tour, I’ve been playing around with ways I want to use pomegranates in recipes. Aside from my favorite way to enjoy a pomegranate, which is simply eating the arils straight from the fruit, I’ve also enjoyed them in salads, and martinis. I have a lot more pomegranate recipes in my head I will be sharing with you in the future. I hope you enjoy the scones as much as I did. Baby Madison enjoyed them too! Combine flour, baking powder, salt, in a large bowl, stirring with a whisk. Gently fold in fresh pomegranates. 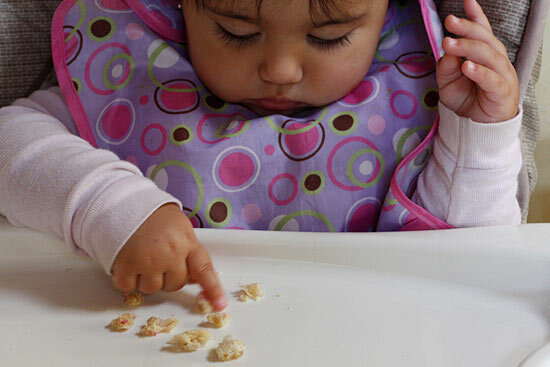 Form dough into an 8-inch circle onto baking sheet, about 3/4″ thick. Using a knife, cut dough into 10 wedges (do not cut all the way through). Brush egg white over dough and sprinkle evenly with sugar. * I’ve been baking with Ultragrain flour lately and loving it. It tastes and looks like white flour, with increased fiber, vitamins and minerals. If you can’t find this, a 50/50 blend of white and whole wheat flour would work. By accident I put 1tsp baking soda instead of baking powder.. I still added the baking powder and they did great! I also substitued milk to almond milk, Delicious! Good to know! Happy you enjoyed them! Love it when something is both beautiful and tastes delicious. What a rare combo! Liquid or dried milk ?? Just made these! They are delicious! i cant find the ultragrain flour but i did find white whole wheat flour. so i was wondering if white whole wheat flour work or is it better to do the white/whole wheat mixture? Can you freeze these or will reheating ruin them? YIKES…………are these YUMMY!!!!!! Totally awesome! Love the little bursts of flavor from the pomegranate. I made 2 since I had a large pomegranate. I added some shredded coconut and used coconut milk since I didn't have regular, it still came out perfect. This recipe is gonna to be a repeat,repeat & repeat for sure. These were incredibly delicious! Trader Joe's sells the pomegranate arils, so I didn't have to take the time to cut open the pomegranate & scoop them out, making this a really quick & easy recipe. Definitely best eaten fresh from the oven when they're still warm! yum, blueberry scones are probably my favorite! Made these with blueberries…OMG!!! Incredible! You rock at this whole recipe thing lady! 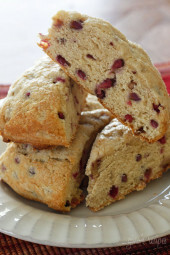 Grace Lee, I have a lemon cranberry scone recipe similar to yours. I love these best fresh out of the oven!! 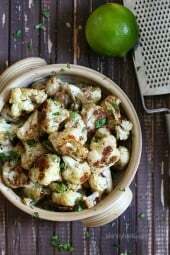 I actually ended up using the lime zest and they taste great!! Love love love the short-bread texture and how it's not too sweet. On the top, after coating with egg whites, I sprinkled sugar in the raw because I don't ever have regular sugar in the house and I think it added a lot to the look and the taste! Also used 1/4 cup of regular brown sugar and that worked just fine. I can't wait to enjoy it with my coffee in the morning! I only have limes and oranges at the moment but am DYING to try making these scones! Which do you think would be a better substitute? Yummy. Your daughter is adorable. Tell me which you like best! I've been using your strawberry scone recipe and adore it, but I think I'll give this one a try. I might have to use blueberries or strawberries since I have them on hand. Sounds wonderful! You come up with the most amazing stuff! I would do one cup white, one cup whole wheat. I'm not sure how it would work with skim. If you try it and it works out, comment back! Gina, do you think these would work out if I used skim milk? That is what we drink at home so that is what I have on hand! Also, what about using all whole wheat flour? I have a few pomegranates sitting at home…I think I will try this! DELISH! 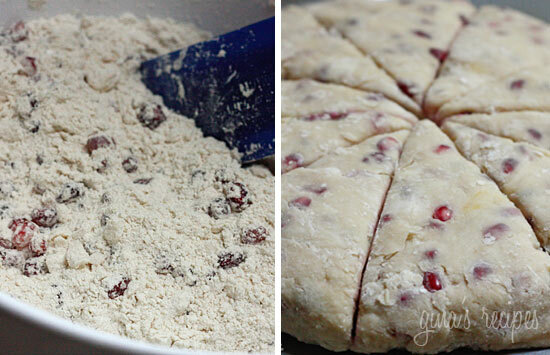 I used dried cranberries, non-fat buttermilk and 50/50 wheat to white flour. They were great. My husband asked me to make a second batch tonight for him to eat for breakfasts this week! Thanks Gina for another keeper! I just pulled these out of the oven…they turned out great! Happened to see the pomegranate arils at Costco yesterday and instantly remembered this recipe. Thanks so much! I think buttermilk would be great here! I LOVE scones, so i love the idea of a healthier one! I have some buttermilk in the fridge that needs to be used, do you think using that in place of the milk will change the flavor? Great Heather, Pomegranate season is almost over, but cranberries would work in place! I made these to take to brunch on Christmas morning, and I'm so glad I did! They're fantastic. Can't wait to finish the leftovers. Thanks sunshine! Splenda does not always work in baking. Thanks for sharing this with me. Healthy and Homemade, I agree!! These look insanely delicious. A scone plus a hot cup of coffee is a great way to start the morning! I tried to cut corners and use Splenda instead of sugar. They were okay. Made them again with the correct ingredients and we love them!!! We add a dollop of Light Whipped Cream. I have made them twice and my whole family loves it. This recipe is a keeper. 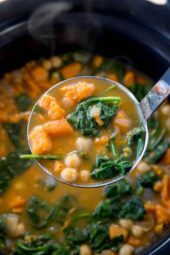 Thanks for sharing such wonderfully tasting healthy recipes!!! Glad you all liked them!! I just made these scones this morning. They are delicious. Thanks!! 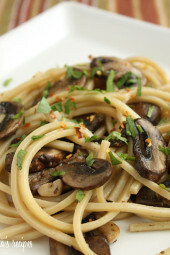 Scouring your site for more recipes like I always do! I made these this afternoon and they are fantastic! They're definitely going into the "goto recipes" file! Thanks for posting this! made these for breakfast this morning and they were delicious! that and some yogurt made for a perfect fall breakfast. thanks! MsJournalist – The arils contain fiber, so don't throw them away! I made this last night and it was delicious. I stopped buying pomegranates a while ago cause I didn't know what to do with them. This was the first time I ever actually ate the seeds. I used to just pop the arils and throw them away. I made this over the weekend and they were a big hit. I've never made scones before and found that they were super easy to make, and those that had never had Pomegranate loved them. I will def. make again. Thank you! Oh I love these! They look absolutely beautiful! Sure, you could use blueberries instead. I've made them with strawberries too. They sell pomegranate arils in containers now for those of you who don't like to peel them, but it really doesn't take very long to open one. Can you use other fruit like blueberries? There are no pomegranates where I live. Love your recipes and my husband loves them too!!!!! Pomegranates – really? Love the taste. HATE peeling them. Haven't done it since I was kid, and probably won't ever do it again. Who's got the time? Cranberries would be nice tho!!!! I think you read my mind! 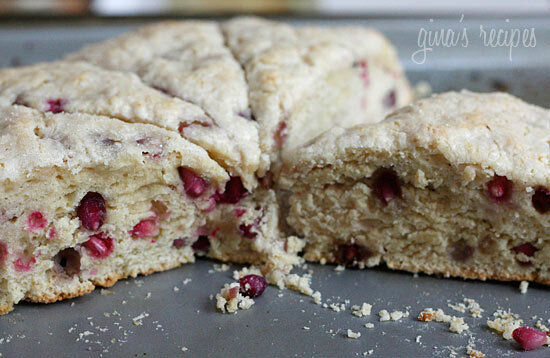 I have been craving scones nonstop for the past 2 weeks… I'm going to make these immediately! Valerie, yes there is a slight crunch as well as subtle sweetness. And the seeds? Do they crunch more when baked. Brilliant healthy idea! Gina, I love scones! I still have a pomegranate left over, so the next time I crack it open, the arils will go into this 🙂 And, oh my babylicious, Madison is adorable! Do the arils retain their juiciness after being baked? Thanks about my daughter, I couldn't pass the picture up! Dana, doesn't it look pretty! Someone mentioned on my other post that they make pomegranate jelly, I wish I had some! Renee – I love them too! I think I just found the perfect snack for tomorrow afternoon. Maybe this entire week! Pomegranates are my favorite fruit! These sound delicious and look great! The pomegranate speck throughout the pastry makes such a pretty presentation! These look super good. I was gonna make Banana nut bread. but i think i will make these instead!!!! Oooh yum! My husband has suggested I make scones, but I'm stumped on what to add to give it some pizzazz. I think this is it! Can't wait to try them. Okay I am going to try this next weekend and I will let you know how we like it. It looks great. Cute little girl also..
Wow! These look amazing! Saving this recipe. My Gina recipes are starting to stack up and I love it! And your girl is SO adorable! !